For other uses, see Hebrides (disambiguation). The Hebrides (/ˈhɛbrɪdiːz/; Scottish Gaelic: Innse Gall, pronounced [ˈĩːʃə ˈkaul̪ˠ]; Old Norse: Suðreyjar) comprise a widespread and diverse archipelago off the west coast of mainland Scotland. There are two main groups: the Inner and Outer Hebrides. These islands have a long history of occupation dating back to the Mesolithic, and the culture of the residents has been affected by the successive influences of Celtic, Norse, and English-speaking peoples. This diversity is reflected in the names given to the islands, which are derived from the languages that have been spoken there in historic and perhaps prehistoric times. The Hebrides are the source of much of Scottish Gaelic literature and Gaelic music. Today the economy of the islands is dependent on crofting, fishing, tourism, the oil industry, and renewable energy. The Hebrides have lower biodiversity than mainland Scotland, but there is a significant presence of seals and seabirds. The earliest written references that have survived relating to the islands were made circa 77 AD by Pliny the Elder in his Natural History, where he states that there are 30 Hebudes, and makes a separate reference to Dumna, which Watson (1926) concludes is unequivocally the Outer Hebrides. Writing about 80 years later, in 140-150 AD, Ptolemy, drawing on the earlier naval expeditions of Agricola, writes that there are five Ebudes (possibly meaning the Inner Hebrides) and Dumna. Later texts in classical Latin, by writers such as Solinus, use the forms Hebudes and Hæbudes. The name Ebudes recorded by Ptolemy may be pre-Celtic. Islay is Ptolemy's Epidion, the use of the "p" hinting at a Brythonic or Pictish tribal name, Epidii, although the root is not Gaelic. Woolf (2012) has suggested that Ebudes may be "an Irish attempt to reproduce the word Epidii phonetically rather than by translating it" and that the tribe's name may come from the root epos meaning "horse". Watson (1926) also notes the possible relationship between Ebudes and the ancient Irish Ulaid tribal name Ibdaig and the personal name of a king Iubdán recorded in the Silva Gadelica. The names of other individual islands reflect their complex linguistic history. The majority are Norse or Gaelic but the roots of several other Hebrides may have a pre-Celtic origin. Adomnán, the 7th century abbot of Iona, records Colonsay as Colosus and Tiree as Ethica, both of which may be pre-Celtic names. The etymology of Skye is complex and may also include a pre-Celtic root. Lewis is Ljoðhús in Old Norse and although various suggestions have been made as to a Norse meaning (such as "song house") the name is not of Gaelic origin and the Norse credentials are questionable. The earliest comprehensive written list of Hebridean island names was undertaken by Donald Monro in 1549, which in some cases also provides the earliest written form of the island name. The derivations of all of the inhabited islands of the Hebrides and some of the larger uninhabited ones are listed below. Lewis and Harris is the largest island in Scotland and the third largest in the British Isles, after Great Britain and Ireland. It incorporates Lewis in the north and Harris in the south, both of which are frequently referred to as individual islands, although they are joined by a land border. Remarkably, the island does not have a common name in either English or Gaelic and is referred to as "Lewis and Harris", "Lewis with Harris", "Harris with Lewis" etc. For this reason it is treated as two separate islands below. The derivation of Lewis may be pre-Celtic (see above) and the origin of Harris is no less problematic. In the Ravenna Cosmography, Erimon may refer to Harris (or possibly the Outer Hebrides as a whole). This word may derive from the Ancient Greek: ἐρῆμος (erimos "desert". The origin of Uist (Old Norse: Ívist) is similarly unclear. Benbecula Peighinn nam Fadhla Gaelic pennyland of the fords Beinn nam Fadhla "little mountain of the ford" or "herdsman's mountain"
Harris Erimon Ancient Greek? desert Harrey na Hearadh Ptolemy's Adru. In Old Norse (and in modern Icelandic), a Hérað is a type of administrative district. Alternatives are the Norse haerri, meaning "hills" and Gaelic na h-airdibh meaning "the heights". Lewis Limnu Pre-Celtic? marshy Lewis Leòdhas Ptolemy's Limnu is literally "marshy". The Norse Ljoðhús may mean "song house" — see above. North Uist English/Pre-Celtic? Ywst Uibhist a Tuath "Uist" may possibly be "corn island" or "west"
There are various examples of Inner Hebridean island names that were originally Gaelic but have become completely replaced. For example, Adomnán records Sainea, Elena, Ommon and Oideacha in the Inner Hebrides, which names must have passed out of usage in the Norse era and whose locations are not clear. One of the complexities is that an island may have had a Celtic name, which was replaced by a similar-sounding Norse name, but then reverted to an essentially Gaelic name with a Norse "øy" or "ey" ending. See for example Rona below. Canna Cana Gaelic porpoise island Kannay Eilean Chanaigh Possibly from Old Irish cana, meaning "wolf-whelp" or Norse kneøy - "knee island"
Colonsay Pre-Celtic Colnansay Colbhasa Norse for "Columba's island"
Easdale Eisdcalfe Eilean Èisdeal Eas is "waterfall" in Gaelic and dale is the Norse for "valley". However the combination seems inappropriate for this small island. Also known as Ellenabeich - "island of the birches"
Eigg Eag Gaelic a notch Egga Eige Also called Eilean Nimban More - "island of the powerful women" until the 16th century. Eilean Shona Norse sea island Eilean Seòna Adomnán records the pre-Norse Gaelic name of Airthrago - the foreshore isle". Gigha Guðey Norse "good island" or "God island" Gigay Giogha Various including the Norse Gjáey - "island of the geo" or "cleft", or "Gydha's isle". Gometra Goðrmaðrey Norse "The good-man's island", or "God-man's island" Gòmastra "Godmund's island". Isle of Ewe Eubh Gaelic echo Ellan Ew Eilean Iùbh Old Irish: eo - "yew"
Iona Hí Gaelic Possibly "yew-place" Colmkill Ì Chaluim Chille Numerous. Adomnán uses Ioua insula which became "Iona" through misreading. Kerrera Kjarbarøy Norse Kjarbar's island Cearrara Norse: ciarrøy - "brushwood island" or "copse island"
Lunga Langrøy Norse longship isle Lungay Lunga Gaelic long is also "ship"
Muck Eilean nam Muc Gaelic isle of pigs Swynes Ile Eilean nam Muc Eilean nam Muc-mhara- "whale island". John of Fordun recorded it as Helantmok - "isle of swine". Mull Malaios Pre-Celtic Mull Muile Recorded by Ptolemy as Malaios possibly meaning "lofty isle". In Norse times it became Mýl. Oronsay Norse ebb island Ornansay Orasaigh Norse: "Oran's island"
Raasay Raasøy Norse roe deer island Raarsay Ratharsair Rossøy - "horse island"
Rùm Pre-Celtic Ronin Rùm Various including Norse rõm-øy for "wide island" or Gaelic ì-dhruim - "isle of the ridge"
Scalpay Skalprøy Norse scallop island Scalpay Sgalpaigh Norse: "ship island"
Seil Possibly Sal Probably pre-Celtic "stream" Seill Saoil Gaelic: sealg - "hunting island"
Shuna Unknown Norse Possibly "sea island" Seunay Siuna Gaelic sidhean - "fairy"
Tiree Eth, Ethica Possibly pre-Celtic Unknown Tiriodh Norse: Tirvist of unknown meaning and numerous Gaelic versions, some with a possible meaning of "land of corn"
The names of uninhabited islands follow the same general patterns as the inhabited islands. The following are the ten largest in the Hebrides and their outliers. The etymology of St Kilda, a small archipelago west of the Outer Hebrides, and its main island Hirta, is very complex. No saint is known by the name of Kilda, and various theories have been proposed for the word's origin, which dates from the late 16th century. Haswell-Smith (2004) notes that the full name "St Kilda" first appears on a Dutch map dated 1666, and that it may have been derived from Norse sunt kelda ("sweet wellwater") or from a mistaken Dutch assumption that the spring Tobar Childa was dedicated to a saint (Tobar Childa is a tautological placename, consisting of the Gaelic and Norse words for well, i.e. "well well"). The origin of the Gaelic for "Hirta"—Hiort, Hirt, or Irt—which long pre-dates the use of "St Kilda", is similarly open to interpretation. Watson (1926) offers the Old Irish hirt, a word meaning "death", possibly relating to the dangerous seas. Maclean (1977), drawing on an Icelandic saga describing an early 13th-century voyage to Ireland that mentions a visit to the islands of Hirtir, speculates that the shape of Hirta resembles a stag, hirtir being "stags" in Norse. The etymology of small islands may be no less complex. In relation to Dubh Artach, R. L. Stevenson believed that "black and dismal" was a translation of the name, noting that "as usual, in Gaelic, it is not the only one." 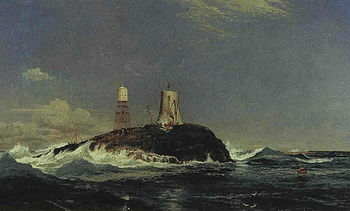 Mingulay Mikilay Norse big island Megaly "Main hill island". Murray (1973) states that the name “appropriately means Bird Island”. Wiay Norse Possibly "house island"
The Hebrides were settled during the Mesolithic era around 6500 BC or earlier, after the climatic conditions improved enough to sustain human settlement. Occupation at a site on Rùm is dated to 8590 ±95 uncorrected radiocarbon years BP, which is amongst the oldest evidence of occupation in Scotland. There are many examples of structures from the Neolithic period, the finest example being the standing stones at Callanish, dating to the 3rd millennium BC. Cladh Hallan, a Bronze Age settlement on South Uist is the only site in the UK where prehistoric mummies have been found. In 55 BC, the Greek historian Diodorus Siculus wrote that there was an island called Hyperborea (which means "beyond the North Wind"), where a round temple stood from which the moon appeared only a little distance above the earth every 19 years. This may have been a reference to the stone circle at Callanish. A traveller called Demetrius of Tarsus related to Plutarch the tale of an expedition to the west coast of Scotland in or shortly before AD 83. He stated it was a gloomy journey amongst uninhabited islands, but he had visited one which was the retreat of holy men. He mentioned neither the druids nor the name of the island. The first written records of native life begin in the 6th century AD, when the founding of the kingdom of Dál Riata took place. This encompassed roughly what is now Argyll and Bute and Lochaber in Scotland and County Antrim in Ireland. The figure of Columba looms large in any history of Dál Riata, and his founding of a monastery on Iona ensured that the kingdom would be of great importance in the spread of Christianity in northern Britain. However, Iona was far from unique. Lismore in the territory of the Cenél Loairn, was sufficiently important for the death of its abbots to be recorded with some frequency and many smaller sites, such as on Eigg, Hinba, and Tiree, are known from the annals. The Hebrides were now part of the Kingdom of the Isles, whose rulers were themselves vassals of the Kings of Norway. 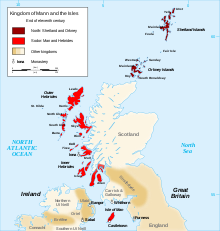 This situation lasted until the partitioning of the Western Isles in 1156, at which time the Outer Hebrides remained under Norwegian control while the Inner Hebrides broke out under Somerled, the Norse-Gael kinsman of the Manx royal house. Following the ill-fated 1263 expedition of Haakon IV of Norway, the Outer Hebrides and the Isle of Man were yielded to the Kingdom of Scotland as a result of the 1266 Treaty of Perth. Although their contribution to the islands can still be found in personal and place names, the archaeological record of the Norse period is very limited. The best known find is the Lewis chessmen, which date from the mid 12th century. As the Norse era drew to a close, the Norse-speaking princes were gradually replaced by Gaelic-speaking clan chiefs including the MacLeods of Lewis and Harris, Clan Donald and MacNeil of Barra. [Note 4] This transition did little to relieve the islands of internecine strife although by the early 14th century the MacDonald Lords of the Isles, based on Islay, were in theory these chiefs' feudal superiors and managed to exert some control. The Lords of the Isles ruled the Inner Hebrides as well as part of the Western Highlands as subjects of the King of Scots until John MacDonald, fourth Lord of the Isles, squandered the family's powerful position. A rebellion by his nephew, Alexander of Lochalsh provoked an exasperated James IV to forfeit the family's lands in 1493. In 1598, King James VI authorised some "Gentleman Adventurers" from Fife to civilise the "most barbarous Isle of Lewis". Initially successful, the colonists were driven out by local forces commanded by Murdoch and Neil MacLeod, who based their forces on Bearasaigh in Loch Ròg. The colonists tried again in 1605 with the same result, but a third attempt in 1607 was more successful and in due course Stornoway became a Burgh of Barony. By this time, Lewis was held by the Mackenzies of Kintail (later the Earls of Seaforth), who pursued a more enlightened approach, investing in fishing in particular. The Seaforths' royalist inclinations led to Lewis becoming garrisoned during the Wars of the Three Kingdoms by Cromwell's troops, who destroyed the old castle in Stornoway. 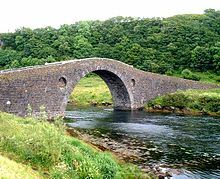 Clachan Bridge between the mainland of Great Britain and Seil, also known as the "Bridge across the Atlantic", was built in 1792. With the implementation of the Treaty of Union in 1707, the Hebrides became part of the new Kingdom of Great Britain, but the clans' loyalties to a distant monarch were not strong. A considerable number of islesmen "came out" in support of the Jacobite Earl of Mar in the 1715 and again in the 1745 rising including Macleod of Dunvegan and MacLea of Lismore. The aftermath of the decisive Battle of Culloden, which effectively ended Jacobite hopes of a Stuart restoration, was widely felt. The British government's strategy was to estrange the clan chiefs from their kinsmen and turn their descendants into English-speaking landlords whose main concern was the revenues their estates brought rather than the welfare of those who lived on them. This may have brought peace to the islands, but in the following century it came at a terrible price. In the wake of the rebellion, the clan system was broken up and islands of the Hebrides became a series of landed estates. The early 19th century was a time of improvement and population growth. Roads and quays were built; the slate industry became a significant employer on Easdale and surrounding islands; and the construction of the Crinan and Caledonian canals and other engineering works such as Clachan Bridge improved transport and access. However, in the mid-19th century, the inhabitants of many parts of the Hebrides were devastated by the Clearances, which destroyed communities throughout the Highlands and Islands as the human populations were evicted and replaced with sheep farms. The position was exacerbated by the failure of the islands' kelp industry that thrived from the 18th century until the end of the Napoleonic Wars in 1815 and large scale emigration became endemic. As Iain Mac Fhearchair, a Gaelic poet from South Uist, wrote for his countrymen who were obliged to leave the Hebrides in the late 18th century, emigration was the only alternative to "sinking into slavery" as the Gaels had been unfairly dispossessed by rapacious landlords. In the 1880s, the "Battle of the Braes" involved a demonstration against unfair land regulation and eviction, stimulating the calling of the Napier Commission. Disturbances continued until the passing of the 1886 Crofters' Act. The Hebrides have a diverse geology ranging in age from Precambrian strata that are amongst the oldest rocks in Europe to Paleogene igneous intrusions. [Note 5] Raised shore platforms in the Hebrides are identified as strandflats formed possibly in Pliocene times and later modified by the Quaternary glaciations. The Hebrides can be divided into two main groups, separated from one another by the Minch to the north and the Sea of the Hebrides to the south. The Inner Hebrides lie closer to mainland Scotland and include Islay, Jura, Skye, Mull, Raasay, Staffa and the Small Isles. There are 36 inhabited islands in this group. The Outer Hebrides are a chain of more than 100 islands and small skerries located about 70 kilometres (43 mi) west of mainland Scotland. There are 15 inhabited islands in this archipelago. The main islands include Barra, Benbecula, Berneray, Harris, Lewis, North Uist, South Uist, and St Kilda. In total, the islands have an area of approximately 7,200 square kilometres (2,800 sq mi) and a population of 44,759. A complication is that there are various descriptions of the scope of the Hebrides. The Collins Encyclopedia of Scotland describes the Inner Hebrides as lying "east of the Minch", which would include any and all offshore islands. There are various islands that lie in the sea lochs such as Eilean Bàn and Eilean Donan that might not ordinarily be described as "Hebridean", but no formal definitions exist. The Hebrides have a cool temperate climate that is remarkably mild and steady for such a northerly latitude, due to the influence of the Gulf Stream. In the Outer Hebrides the average temperature for the year is 6 °C (44 °F) in January and 14 °C (57 °F) in summer. The average annual rainfall in Lewis is 1,100 millimetres (43 in) and sunshine hours range from 1,100 – 1,200 per annum (13%). The summer days are relatively long, and May to August is the driest period. The residents of the Hebrides have spoken a variety of different languages during the long period of human occupation. It is assumed that Pictish must once have predominated in the northern Inner Hebrides and Outer Hebrides. The Scottish Gaelic language arrived from Ireland due to the growing influence of the kingdom of Dál Riata from the 6th century AD onwards, and became the dominant language of the southern Hebrides at that time. For a few centuries, the military might of the Gall-Ghàidheil meant that Old Norse was prevalent in the Hebrides. North of Ardnamurchan, the place names that existed prior to the 9th century have been all but obliterated. The Old Norse name for the Hebrides during the Viking occupation was Suðreyjar, which means "Southern Isles"; in contrast to the Norðreyjar, or "Northern Isles" of Orkney and Shetland. South of Ardnamurchan, Gaelic place names are more common, and after the 13th century, Gaelic became the main language of the entire Hebridean archipelago. Due to Scots and English being favoured in government and the educational system, the Hebrides have been in a state of diglossia since at least the 17th century. The Highland Clearances of the 19th century accelerated the language shift away from Scottish Gaelic, as did increased migration and the continuing lower status of Gaelic speakers. Nevertheless, as late as the end of the 19th century, there were significant populations of monolingual Gaelic speakers, and the Hebrides still contain the highest percentages of Gaelic speakers in Scotland. This is especially true of the Outer Hebrides, where a slim majority speak the language. The Scottish Gaelic college, Sabhal Mòr Ostaig, is based on Skye and Islay. 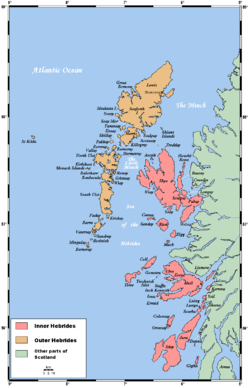 Ironically, given the status of the Western Isles as the last Gaelic-speaking stronghold in Scotland, the Gaelic language name for the islands – Innse Gall – means "isles of the foreigners"; from the time when they were under Norse colonisation. For those who remained, new economic opportunities emerged through the export of cattle, commercial fishing and tourism. Nonetheless emigration and military service became the choice of many and the archipelago's populations continued to dwindle throughout the late 19th century and for much of the 20th century. Lengthy periods of continuous occupation notwithstanding, many of the smaller islands were abandoned. There were, however, continuing gradual economic improvements, among the most visible of which was the replacement of the traditional thatched blackhouse with accommodation of a more modern design and with the assistance of Highlands and Islands Enterprise many of the islands' populations have begun to increase after decades of decline. The discovery of substantial deposits of North Sea oil in 1965 and the renewables sector have contributed to a degree of economic stability in recent decades. For example, the Arnish yard has had a chequered history but has been a significant employer in both the oil and renewables industries. The widespread immigration of mainlanders, particularly non-Gaelic speakers, has been a subject of controversy. Many contemporary Gaelic musicians have roots in the Hebrides, including Julie Fowlis (North Uist), Catherine-Ann MacPhee (Barra), Kathleen MacInnes (South Uist), and Ishbel MacAskill (Lewis). All of these singers have repertoire based on the Hebridean tradition, such as puirt à beul and òrain luaidh (waulking songs). This tradition includes many songs composed by little-known or anonymous poets before 1800, such as "Fear a' bhàta", "Ailein duinn" and "Alasdair mhic Cholla Ghasda". Several of Runrig's songs are inspired by the archipelago; Calum and Ruaraidh Dòmhnallach were raised on North Uist and Donnie Munro on Skye. The Gaelic poet Alasdair mac Mhaighstir Alasdair spent much of his life in the Hebrides and often referred to them in his poetry, including in An Airce and Birlinn Chlann Raghnaill. The best known Gaelic poet of her era, Màiri Mhòr nan Òran (Mary MacPherson, 1821–98), embodied the spirit of the land agitation of the 1870s and 1880s. This, and her powerful evocation of the Hebrides—she was from Skye—has made her among the most enduring Gaelic poets. Allan MacDonald (1859–1905), who spent his adult life on Eriskay and South Uist, composed hymns and verse in honour of the Blessed Virgin, the Christ Child, and the Eucharist. In his secular poetry, MacDonald praised the beauty of Eriskay and its people. In his verse drama, Parlamaid nan Cailleach (The Old Wives' Parliament), he lampooned the gossiping of his female parishioners and local marriage customs. In the 20th century, Murdo Macfarlane of Lewis wrote Cànan nan Gàidheal, a well-known poem about the Gaelic revival in the Outer Hebrides. Sorley MacLean, the most respected 20th-century Gaelic writer, was born and raised on Raasay, where he set his best known poem, Hallaig, about the devastating effect of the Highland Clearances. Aonghas Phàdraig Caimbeul, raised on South Uist and described by MacLean as "one of the few really significant living poets in Scotland, writing in any language" (West Highland Free Press, October 1992) wrote the Scottish Gaelic-language novel An Oidhche Mus do Sheòl Sinn which was voted in the Top Ten of the 100 Best-Ever Books from Scotland. The area around the Inaccessible Pinnacle of Sgurr Dearg of Skye provided the setting for the Scottish Gaelic feature film Seachd: The Inaccessible Pinnacle (2006). The script was written by the actor, novelist, and poet Aonghas Phàdraig Chaimbeul, who also starred in the movie. An Drochaid, an hour-long documentary in Scottish Gaelic, was made for BBC Alba documenting the battle to remove tolls from the Skye bridge. J.M. Barrie's Marie Rose contains references to Harris inspired by a holiday visit to Amhuinnsuidhe Castle and he wrote a screenplay for the 1924 film adaptation of Peter Pan whilst on Eilean Shona. 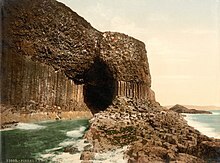 The Hebrides, also known as Fingal's Cave, is a famous overture composed by Felix Mendelssohn while residing on these islands, while Granville Bantock composed the Hebridean Symphony. Enya's song "Ebudæ" from Shepherd Moons is named for the Hebrides (see below). The 1973 British horror film The Wicker Man is set on the fictional Hebridean island of Summerisle. The 2011 British romantic comedy The Decoy Bride is set on the fictional Hebrides island of Hegg. In some respects the Hebrides lack biodiversity in comparison to mainland Britain; for example, there are only half as many mammalian species. However, these islands provide breeding grounds for many important seabird species including the world's largest colony of northern gannets. Avian life includes the corncrake, red-throated diver, rock dove, kittiwake, tystie, Atlantic puffin, goldeneye, golden eagle and white-tailed sea eagle. The latter was re-introduced to Rùm in 1975 and has successfully spread to various neighbouring islands, including Mull. There is a small population of red-billed chough concentrated on the islands of Islay and Colonsay. Red deer are common on the hills and the grey seal and common seal are present around the coasts of Scotland. Colonies of seals are found on Oronsay and the Treshnish Isles. The rich freshwater streams contain brown trout, Atlantic salmon and water shrew. Offshore, minke whales, Killer whales, basking sharks, porpoises and dolphins are among the sealife that can be seen. Heather moor containing ling, bell heather, cross-leaved heath, bog myrtle and fescues is abundant and there is a diversity of Arctic and alpine plants including Alpine pearlwort and mossy cyphal. Loch Druidibeg on South Uist is a national nature reserve owned and managed by Scottish Natural Heritage. The reserve covers 1,677 hectares across the whole range of local habitats. Over 200 species of flowering plants have been recorded on the reserve, some of which are nationally scarce. South Uist is considered the best place in the UK for the aquatic plant slender naiad, which is a European Protected Species. Hedgehogs are not native to the Outer Hebrides—they were introduced in the 1970s to reduce garden pests—and their spread poses a threat to the eggs of ground nesting wading birds. In 2003, Scottish Natural Heritage undertook culls of hedgehogs in the area although these were halted in 2007 due to protests. Trapped animals were relocated to the mainland. ^ There are two inhabited islands called "Grimsay" or Griomasaigh that are joined to Benbecula by a road causeway, one to the north at grid reference NF855572 and one to the south east at grid reference NF831473. ^ Thompson (1968) provides a more literal translation: "Fire played in the fig-trees of Liodhus; it mounted up to heaven. Far and wide the people were driven to flight. The fire gushed out of the houses". ^ The transitional relationships between Norse and Gaelic-speaking rulers are complex. The Gall-Ghàidhels who dominated much of the Irish Sea region and western Scotland at this time were of joint Gaelic and Scandinavian origin. When Somerled wrested the southern Inner Hebrides from Godred the Black in 1156, this was the beginnings of a break with nominal Norse rule in the Hebrides. Godred remained the ruler of Mann and the Outer Hebrides, but two years later Somerled's invasion of the former caused him to flee to Norway. Norse control was further weakened in the ensuring century, but the Hebrides were not formally ceded by Norway until 1266. The transitions from one language to another are also complex. For example, many Scandinavian sources from this period of time typically refer to individuals as having a Scandinavian first name and a Gaelic by-name. ^ Rollinson (1997) states that the oldest rocks in Europe have been found "near Gruinard Bay" on the Scottish mainland. Gillen (2003) p. 44 indicates the oldest rocks in Europe are found "in the Northwest Highlands and Outer Hebrides". McKirdy, Alan Gordon, John & Crofts, Roger (2007) Land of Mountain and Flood: The Geology and Landforms of Scotland. Edinburgh. Birlinn. p. 93 state of the Lewisian gneiss bedrock of much of the Outer Hebrides that "these rocks are amongst the oldest to be found anywhere on the planet". Other non-geological sources sometimes claim the rocks of Lewis and Harris are "the oldest in Britain", meaning that they are the oldest deposits of large bedrock. As Rollinson makes clear they are not the location of the oldest small outcrop. ^ Murray (1973) notes that "Western Isles" has tended to mean "Outer Hebrides" since the creation of the Na h-Eileanan an Iar or Western Isles parliamentary constituency in 1918. Murray also notes that "Gneiss Islands" – a reference to the underlying geology – is another name used to refer to the Outer Hebrides, but that its use is "confined to books". ^ Louis Deroy & Marianne Mulon (1992) Dictionnaire de noms de lieux, Paris: Le Robert, article "Hébrides"
^ Woolf, Alex (2012) Ancient Kindred? Dál Riata and the Cruthin. Academia.edu. Retrieved 21 January 2015. ^ Haswell-Smith (2004) p. 262. ^ Thompson (1968) p. 13. ^ a b "The Roman Map of Britain Maiona (Erimon) 7 Lougis Erimon Isles of Harris and Lewis, Outer Hebrides " Archived 27 November 2013 at the Wayback Machine romanmap.com. Retrieved 1 February 2011. ^ Megaw, J.V. S. and SIMPSON, D.A. (1960) "A short cist burial on North Uist and some notes on the prehistory of the Outer Isles in the second millennium BC" (pdf) p. 72 Proc Soc Antiq Scot. archaeologydataservice.ac.uk. Retrieved 13 February 2011. ^ "Etymology of British place-names" Archived 9 September 2013 at the Wayback Machine www.pbenyon1.plus.com. Retrieved 13 February 2011. ^ Hákonar saga Hákonarsonar, § 328, line 8 Retrieved 2 February 2011. ^ a b Gillies (1906) p. 129. "Gometra, from N., is gottr + madr + ey." ^ "Group 34: islands in the Irish Sea and the Western Isles 1" kmatthews.org.uk. Retrieved 1 March 2008. ^ Buchanan (1983) Pages 2–6. ^ Haswell-Smith (2004) pp. 314–25. ^ Newton, Michael Steven. The Naughty Little Book of Gaelic: All the Scottish Gaelic You Need to Curse, Swear, Drink, Smoke and Fool around. Sydney, Nova Scotia: Cape Breton UP, 2014. ^ Maclean (1977) page 33. ^ Stevenson (1872) p. 10. ^ Murray (1973) p. 41. ^ Edwards, Kevin J., and Mithen, Steven (Feb., 1995) "The Colonization of the Hebridean Islands of Western Scotland: Evidence from the Palynological and Archaeological Records," World Archaeology. 26. No. 3. p. 348. Retrieved 20 April 2008. ^ Li, Martin (2005) Adventure Guide to Scotland. Hunter Publishing. p. 509. ^ "Mummification in Bronze Age Britain" BBC History. Retrieved 11 February 2008. ^ "The Prehistoric Village at Cladh Hallan". University of Sheffield. Retrieved 21 February 2008. ^ See for example Haycock, David Boyd. "Much Greater, Than Commonly Imagined." Archived 26 February 2009 at the Wayback Machine The Newton Project. Retrieved 14 March 2008. ^ Moffat, Alistair (2005) Before Scotland: The Story of Scotland Before History. London. Thames & Hudson. pp. 239-40. ^ Clancy, Thomas Owen "Church institutions: early medieval" in Lynch (2001). ^ "The Kingdom of Mann and the Isles" thevikingworld.com Retrieved 6 July 2010. ^ Downham (2007) pp. 174-75. ^ "Dunvegan" Archived 4 June 2013 at the Wayback Machine castlescotland.net Retrieved 17 January 2011. ^ "Incidents of the Jacobite Risings - Donald Livingstone" clanmclea.co.uk. Retrieved 17 January 2011. ^ "The Battle of Culloden" BBC. Retrieved 16 January 2011. ^ Newton, Michael. "Highland Clearances Part 3". The Virtual Gael. Retrieved 7 January 2017. ^ Rollinson, Hugh (September 1997). "Britain's oldest rocks" Geology Today. 13 no. 5 pp. 185-190. ^ Gillen, Con (2003). Geology and landscapes of Scotland. Harpenden. Terra Publishing. Pages 44 and 142. ^ Dawson, Alastrair G.; Dawson, Sue; Cooper, J. Andew G.; Gemmell, Alastair; Bates, Richard (2013). "A Pliocene age and origin for the strandflat of the Western Isles of Scotland: a speculative hypothesis". Geological Magazine. 150 (2): 360–366. doi:10.1017/S0016756812000568. ^ Keay & Keay (1994) p. 507. ^ Encyclopædia Britannica (1978) states: Hebrides – group of islands of the west coast of Scotland extending in an arc between 55.35 and 58.30 N and 5.26 and 8.40 W." This includes Gigha, St Kilda and everything up to Cape Wrath – although not North Rona. ^ Murray (1973) p. 32. ^ Brown, James (1892) "Place-names of Scotland" p. 4 ebooksread.com. Retrieved 13 February 2011. ^ a b Duwe, Kurt C. "Gàidhlig (Scottish Gaelic) Local Studies". Linguae Celticae. ^ Mac an Tàilleir, Iain (2004) "1901–2001 Gaelic in the Census" (PowerPoint) Linguae Celticae. Retrieved 1 June 2008. ^ "A' Cholaiste". UHI. Retrieved 30 May 2011. ^ "Blackhouses" Archived 19 January 2010 at the Wayback Machine. isle-of-lewis.com Retrieved 17 January 2011. ^ "Yard wins biggest wind tower job". BBC News Online. 10 December 2007. Retrieved 6 January 2011. ^ Emily McEwan-Fujita - Academia.edu. "Ideology, Affect and Socialization in Language Shift and Revitalization: The Experiences of Adults Learning Gaelic in the Western Isles of Scotland". academia.edu. Retrieved 15 April 2017. ^ Charles Jedrej; Mark Nuttall (1996). White Settlers: Impact/Cultural. p. 117. ISBN 9781134368501. Retrieved 25 January 2017. ^ "Julie Fowlis". Thistle and Shamrock. NPR. 22 May 2013. Retrieved 10 June 2013. ^ Hebrides on IMDb . Retrieved 15 April 2017. ^ "Donnie Munro: Biography" Archived 30 May 2014 at the Wayback Machine donniemunro.co.uk. Retrieved 5 April 2007. ^ John Lorne Campbell, "Canna: The Story of a Hebridean Island," Oxford University Press, 1984, pages 104–105. ^ J. MacDonald, "Gaelic literature" in M. Lynch, ed., The Oxford Companion to Scottish History (Oxford: Oxford University Press, 2001), ISBN 0-19-211696-7, pp. 255-7. ^ "Làrach nam Bàrd". BBC Alba. ^ MacLean, Sorley (1954) Hallaig. Gairm magazine. Translation by Seamus Heaney (2002). Guardian.co.uk. Retrieved 27 May 2011. ^ a b "Angus Peter Campbell | Aonghas Phadraig Caimbeul - Fiosrachadh/Biog". Angus Peter Campbell. Retrieved 15 April 2017. ^ "An Drochaid / The Bridge Rising". Media Co-op. January 2013. Retrieved 25 January 2017. ^ "An Drochaid". BBC Alba. Retrieved 25 January 2017. ^ "Famous Visitors to the Islands - Luchd-tadhail Ainmeil" Culture Hebrides. Retrieved 26 July 2008. ^ Thomson, Gordon (28 May 2009) "The house where Big Brother was born" New Statesman. Retrieved 11 July 2011. ^ Bold, Alan (29 December 1983) The Making of Orwell's 1984The Glasgow Herald - Google News Archive Search . Retrieved 11 July 2011. ^ "Translations for Shepherd Moons". pathname.com. Retrieved 20 May 2011. ^ "The various versions of The Wicker Man". Steve Philips. Retrieved 18 June 2013. ^ "Seabirds" Archived 3 June 2013 at the Wayback Machine. National Trust for Scotland. Retrieved 20 July 2013. ^ "Trotternish Wildlife" Archived 29 October 2013 at the Wayback Machine Duntulm Castle. Retrieved 25 October 2009. ^ Watson, Jeremy (12 October 2006). "Sea eagle spreads its wings...". Edinburgh: Scotland on Sunday. ^ Benvie (2004) p. 118. ^ "Protected mammals - Seals". Scottish Natural Heritage. Retrieved 6 March 2011. ^ "Trout Fishing in Scotland: Skye" trout-salmon-fishing.com. Retrieved 29 March 2008. ^ "Trends - The Sea" (PDF). Scottish Natural Heritage. Retrieved 1 January 2007. ^ "Species List". www.whalewatchingtrips.co.uk. Retrieved 28 December 2010. ^ "Loch Druidibeg National Nature Reserve: Where Opposites Meet". Archived 3 March 2016 at the Wayback Machine (pdf) SNH. Retrieved 29 July 2007. ^ "South Uist and Eriskay attractions" Archived 14 January 2015 at the Wayback Machine isle-of-south-uist.co.uk. Retrieved 5 July 2010. ^ "Higher plant species: 1833 Slender naiad" JNCC. Retrieved 29 July 2007. ^ "Statutory Instrument 1994 No. 2716 " Archived 18 May 2009 at the Wayback Machine Office of Public Sector Information. Retrieved 5 July 2010. ^ "Campaign to stop the slaughter of over 5000 Hedgehogs on the Island of Uist". Epping Forest Hedgehog Rescue. Archived from the original on 27 August 2006. Retrieved 1 January 2007. ^ Ross, John (21 February 2007). "Hedgehogs saved from the syringe as controversial Uist cull called off". The Scotsman. Edinburgh. Ballin Smith, Beverley; Taylor, Simon; and Williams, Gareth (2007) West over Sea: Studies in Scandinavian Sea-Borne Expansion and Settlement Before 1300. Leiden. Brill. Fraser Darling, Frank; Boyd, J. Morton (1969). The Highlands and Islands. The New Naturalist. London: Collins. First published in 1947 under title: Natural history in the Highlands & Islands; by F. Fraser Darling. First published under the present title 1964. Gammeltoft, Peder (2010) "Shetland and Orkney Island-Names – A Dynamic Group". Northern Lights, Northern Words. Selected Papers from the FRLSU Conference, Kirkwall 2009, edited by Robert McColl Millar. "Occasional Paper No 10: Statistics for Inhabited Islands". (28 November 2003) General Register Office for Scotland. Edinburgh. Retrieved 22 January 2011. Gillies, Hugh Cameron (1906) The Place Names of Argyll. London. David Nutt. Haswell-Smith, Hamish (2004). The Scottish Islands. Edinburgh: Canongate. ISBN 978-1-84195-454-7. Keay, J. & Keay, J. (1994) Collins Encyclopaedia of Scotland. London. HarperCollins. Lynch, Michael (ed) (2007) Oxford Companion to Scottish History. Oxford University Press. ISBN 978-0-19-923482-0. Mac an Tàilleir, Iain (2003) Ainmean-àite/Placenames. (pdf) Pàrlamaid na h-Alba. Retrieved 26 August 2012. Monro, Sir Donald (1549) A Description Of The Western Isles of Scotland. Appin Regiment/Appin Historical Society. Retrieved 3 March 2007. First published in 1774. Murray, W. H. (1966) The Hebrides. London. Heinemann. Ordnance Survey (2009) "Get-a-map". Retrieved 1–15 August 2009. Slesser, Malcolm (1970) The Island of Skye. Edinburgh. Scottish Mountaineering Club. Stevenson, Robert Louis (1995) The New Lighthouse on the Dhu Heartach Rock, Argyllshire. California. Silverado Museum. Based on an 1872 manuscript and edited by Swearingen, R.G. Watson, W. J. (1994) The Celtic Place-Names of Scotland. Edinburgh. Birlinn. ISBN 1-84158-323-5. First published 1926. Wikivoyage has a travel guide for Hebrides. Wikimedia Commons has media related to Hebrides. "Hebrides, The" . Encyclopædia Britannica (11th ed.). 1911.